Senior game designer Jeremy Feasel and lead game producer Ray Cobo discuss Battle for Azeroth. It was a big BlizzCon for World of Warcraft fans. The MMO, which turns 13 in Oceania later this month, is getting an exciting-looking new expansion, a ton of tweaks, and much-requested "vanilla" servers. In upcoming chapter Battle for Azeroth, the fall of the Burning Legion has set off a series of disastrous incidents that reignites the furious rivalry between the noble Alliance and the mighty Horde. As a new age of warfare begins, Azeroth’s heroes must set out on a harrowing journey in search of new allies, race to claim the world’s mightiest resources to turn the tides of war, and fight on several fronts to determine which side will lead Azeroth into its uncertain future. The expansion comes with two new continents housing the stories of some of Azeroth’s most iconic heroes and leaders, six new Allied Races, levelling improvements, a powerful new armour-boosting artefact called The Heart of Azeroth, small three-player missions called Island Expeditions, large 20 player PvE sieges called Warfronts, and a slew of PvP updates with notable changes for world PvP. Of course, there will also be a new Battleground, a new Raid, and a bunch of new dungeons to conquer as well. As far as WoW expansions go, it's shaping up to be one of the more significant. At BlizzCon, I sat down with senior game designer Jeremy Feasel and lead game producer Ray Cobo to discuss the new announcements. Our full chat is in the video, but I've transcribed some juicy bits below. Q: So, WoW Classic. How's it going to work? How many details can you give me on this thing? Ray Cobo: Really not a huge amount. We are really excited about it – we have a huge amount of passion in our team. It wouldn't have been able to come to pass had it not been for a lot of people pushing for this internally and in the community, and we heard them and felt like Classic is definitely something we can do. There's a lot of questions – a huge amount of systemic questions, production questions, design questions – that we're just not quite ready to answer yet. J Allen Brack put this best when he said, "Is this World of Warcraft when it very first came out? Is this World of Warcraft two years later?" If you were there for the beginning, there's a huge amount of stuff that occurred in-between there. So, tons and tons of questions to answer, and it's absolutely something that now that we've pitched it out there. We wanna hear back from the community: everything from new character looks to old character looks – what would people prefer? Please tell us. Jeremy Feasel: We wanna make sure we're delivering the gameplay experience of that nostalgic moment when we first started to play WoW. And we wanna try and skirt away from all the technical hurdles we ran into at launch. We have an initial starting place, but it's very early. Ray Cobo: It's gonna be super hilarious when that first character hits that level where they can buy a mount, and they can't buy that mount because they don't have enough gold, and somebody comes and ganks them, and they're like "That's not fair!" Yeah, there's a lot of questions to answer [laughs]. Jeremy Feasel: We've got a separate team dedicated to making that whole endeavour because we don't wanna impact our ability to make Battle for Azeroth or any future expansions. Q: Each year the pressure to up the pace of content delivery seems to increase, and Blizzard respond in kind. With that in mind, what can we expect in terms of the latest expansion? Ray Cobo: We absolutely loved the cadence that we came out with in Legion, and we feel like we kept players really engaged with the game – we gave them plenty of stuff to do over the course of the Legion expansion. If there is one thing we probably learned from that experience, it's that maybe that Karazhan patch came out a little big too early. But… we wanna continue with that cadence. And we haven't left Legion in the dust yet, there's still stories to tell there. You guys are going to be seeing a lot of awesome features coming into Legion. Q: Did you have the horde versus alliance aspect of the expansion in mind when Jaina ducked out at the start of Legion? The character arc for this particular expansion goes all the way back to Mists of Pandaria, when we started Garosh going back into Warlords territory… At a certain point, especially as a storyteller, you get to the realm where you're fighting titanic creatures the size of planets, and you maybe forget who you are fighting for. The initial stories you were playing out were stories of people. And I think when we get to far-off planets and fight titanic creatures, sometimes we lose sight of who we are fighting for, and why, and why that matters. As a storyteller, it's great to be able to get back there and tell stories of people, how they live, and how the decisions of their leaders impact them. 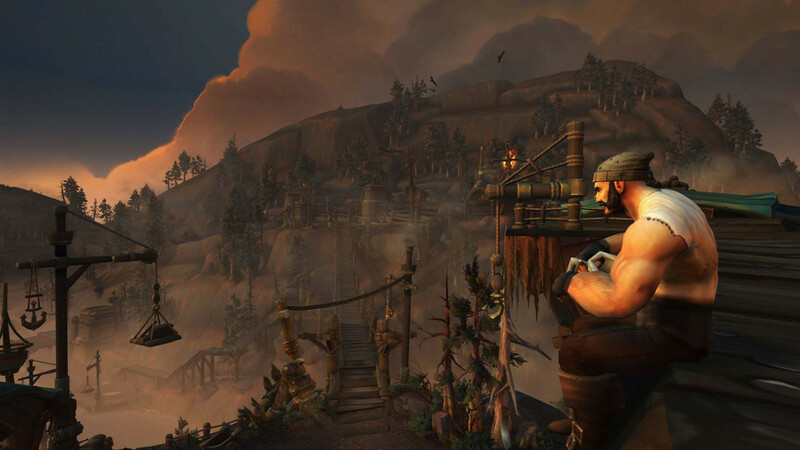 It gives us a chance to get back to really to the core of who you are as a World of Warcraft player. Who you are fighting for, and why it matters. And as soon as it matters, every story we tell in the future is significantly more poignant.